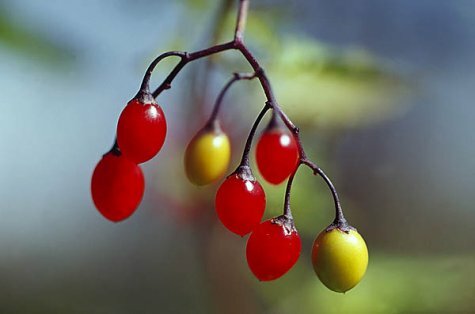 There are two species of "maavits", “ground vine“, in Estonia – the bittersweet, “harilik maavits“, with its red fruits, and the black nightshade, "must maavits“, (Solanum nigrum ), with black fruits. The first is a perennial semishrub and common in our nature, habitat sparse forests or damp brushwoods, the second is a relatively common weed in fields and an annual. All parts of the plant are slightly toxic and if the berrries are eaten they can cause vomiting. In case of poisoning the vomiting is only for good because so the body can get rid of most of the ingested poisons. As a first aid charcoal tablets can be given. They are potato relatives, the genus name of the potato is also Solanum.